Stories in this edition of this CO Update remind me of the importance of solidarity with conscientious objectors. Conscientious objector Visa Savolainen was one of those detained COs who received letters of solidarity in December 2015 on Prisoners for Peace Day. Visa wrote a reflection on his blog on the joy of receiving these. International Prisoners for Peace Day has been celebrated on December 1st for years. The purpose of the day is to provoke conversation and commemorate peace prisoners with different expressions of support and solidarity. In a joint action War Resisters’ International, Connection e.V. (Germany), Amnesty International Korea and World Without War (South Korea) today presented more than 8,000 signatures from 108 countries, including members of parliaments from Germany, European Union and South Korea, to the ministry of defense in Seoul, the capital of South Korea. The organizations demand the recognition of conscientious objection and the immediate and unconditional release of conscientious objectors in prison (...more). The signatures were presented by an international delegation on the International Day of Prisoners for Peace, December 1, with participation from War Resisters‘ International and Connection e.V. The Revolutionary Armed Forces of Colombia—People's Army (Fuerzas Armadas Revolucionarias de Colombia: FARC) have released the first of an estimated 2,000 child soldiers from within its ranks. Last week, it declared its intention to stop recruiting under 18s. In Cyprus, conscripts deemed to be 'mentally unfit' (here we quote the government source, and apologise for the language) will no longer be able to secure a full discharge but will be required to serve in the army for a period one-third longer than the normal stint, under new legislation designed to deter potential 'draft dodgers'. Defence minister Christoforos Fokaides told Daily Politis that draftees diagnosed with psychological problems would serve out an alternative service, not at military installations but at defence-related services. The Syrian Human Rights Network has accused the Syrian regime of arresting civilians for forced army conscription, saying it has documented more than 1,000 cases of arrest for this purpose in the past six weeks alone. Children are also being recruited by different warring parties, UNICEF say. At least several hundred children were recruited in 2015, and thousands killed or injured in the conflict. Ukrainian journalist and CO Ruslan Kotsaba is on trial in Ivano-Frankivsk. Ruslan has been in detention for almost a year, charged with treason and obstructing the military. In a video addressed to the Ukrainian President, he declared his refusal to be drafted, saying he would rather go to prison for five years than turn a weapon on his "compatriots in the east". He called on his fellow countrymen to refuse to be drafted. Ukrainian law does allow individuals to refuse military service, but this right is confined to a small group of religious minorities. He could face 15 years in gaol. Observers from DFG-VK were present, and rallied outside the court. The trial is ongoing. We have started collecting information through a questionnaire, but still missing contacts in many countries. 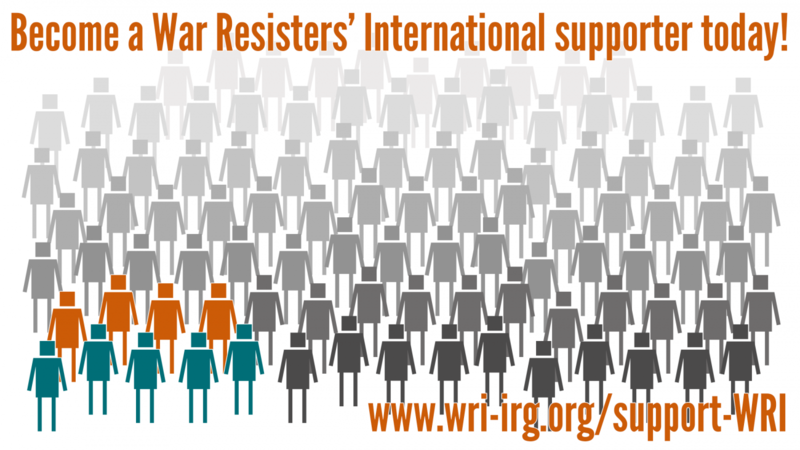 If you have the relevant information on one of the following countries, please email taya@wri-irg.org: Algeria, Burkino Faso, Cambodia, China, Comoros, Dominican Republic, Gambia, Honduras, Jamaica, Liechenstein, Malaysia, Myanmar, Samoa, Suriname, Trinidad and Tobago. A conscientious objector in Bolivia, José Miguel Orías, has been recognised as a CO by a court in La Paz, provided he fulfills conditions they have stipulated. The Constitutional Court will now review the decision made in La Paz; this will likely happen within the next six months. The Bolivian Minister of Defence has previously publicly rejected the possibility of Bolivia recoginsiing the right of conscientious objection to military service, so the Constitutional Court may mirror his opinion. The United Nations' Human Rights' Committee have published new concluding observations following the examination of Austria and the Republic of Korea (South Korea) as part of the Universal Periodic Review. Published September 2015 - download here. A factsheet has been published covering case law within the European Court of Human Rights and Selection of cases pending before the Court, relating to conscientious objection to military service.